The Congressional Progressive Caucus sounded the alarm bells at a press conference by pointing out that Trump is filling his cabinet with cronies, misfits, and stooges who are set to do the opposite of what the president-elect campaigned on. 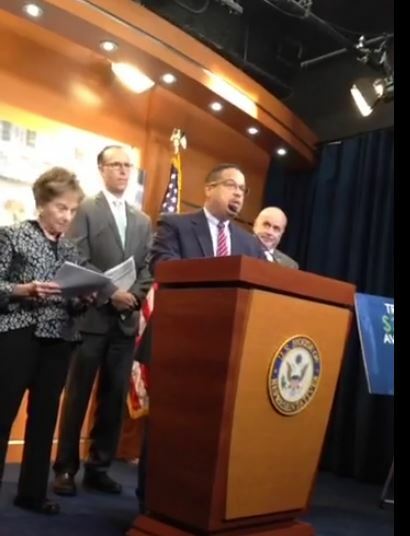 At a press conference, Congressional Progressive Caucus co-chair, Rep. Keith Ellison (D-MN) said, “It’s not just one pick here or one pick there, but the sum total of all represent a disturbing trend in which we have seen the proposal for the person to lead the education who wants to privatize it. The person who is offered in the middle of a great housing crisis the person for that position has no experience on housing….If personnel is policy, we’re looking at some pretty scary policy. What is very clear is that Trump is playing the same role in his administration that he played in the private sector. Trump is the pitch man who is out there pushing a message to the American people, but the actual product that will be produced will have no resembelence to what Trump is selling on his Twitter account. Trump’s populism was a cover for an ultra-aggressive upward redistribution of resources to the wealthiest Americans and biggest corporations. Trump isn’t feeling his cabinet with champions for the common man and woman. The president-elect is filling the executive branch with stooges, misfits, and enemies who will dismantle and plunder the federal govermment from within. What people voted for and what they are about to get are two very different things. Donald Trump;s billionaire fraudster squad is taking over leadership of the world’s only superpower, and they are going to use their position to turn the United States into a nation where the government works for top one percent. ©2008 - 2016, PoliticusUSA.com. All rights reserved.